My lighthouse loving friend got a little surprise today. She gave me this kit a while ago because she was having a clear out and had no intention of ever doing cross stitch again. Lucky me! As you can see, the kit has a lovely clear chart and it only took me a couple of evenings to stitch and finish it into a bookmark for her. The aida fabric is quite a rustic grey beige and there’s still enough left to make at least one more bookmark. I simply backed it with dark brown felt and pinked the edges. It’s lovely – I especially like the effect of the waves breaking against the rock at the base. Nice surprise for your friend! She’s a very special person and deserves a little surprise now and again. You see….I didn’t think of that 😮. 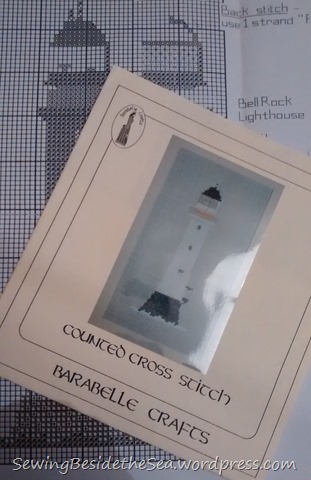 I am the very lucky recipient of the Bell Rock lighthouse and I love it. Of course what makes it more special is that you made it. Thank you so much. It is too nice for a book mark I am going to find a place to display it. 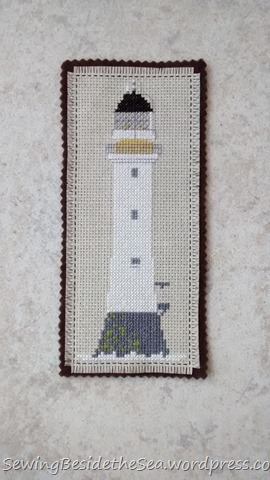 Only a few weeks ago I was in Scotland visiting lighthouses and although I wasn’t able to get out to Bell Rock I was able to see it from Arbroath harbour with my binoculars so that makes this gift even more notable. It’s really nice. Lucky you. A fun project, and a great history lesson too! It’s sometimes surprising what’s behind a cross stitch kit isn’t it?